Born in Japan. Koki started ballet at the age of 11 and trained at Tokyo Ballet School. In 2013, he moved to Switzerland to enter Rudra Béjart School, where he learned classical ballet, contemporary ballet, Martha Graham technique, acrobatics and theater. In 2015, Koki moved to New York City to join Gelsey Kirkland Ballet as a principal dancer. He danced principal and soloist roles in The Nutcracker, Harlequinada, La Vivandiere and Walpurgis Night. Last season, Koki danced Monkey King in Mowgli, Cavalier in Nutcracker, Val Caniparoli’s Tutto Eccetto Il Lavandino and Toni Pimble’s Peer Gynt. 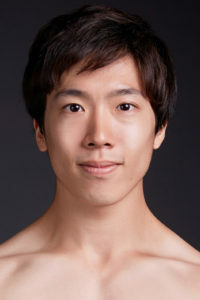 This is Koki’s second season with Eugene Ballet.